Imagine that you moved into a new apartment and brought with her favorite curtains. Or buy curtain fabric, does not calculate the size of the window opening. If the shower curtain a bit short, don't worry – you can extend the curtains so that they absolutely will change and will bring new accents in the interior of the room. Sew the curtain woven loop, which you then put on the round ledge. So it is possible to increase the length of the curtain 10 centimeters. Loop sew one-piece, button-down or simple strings of bows. Last option is fit into the corner of a young girl or in the nursery. 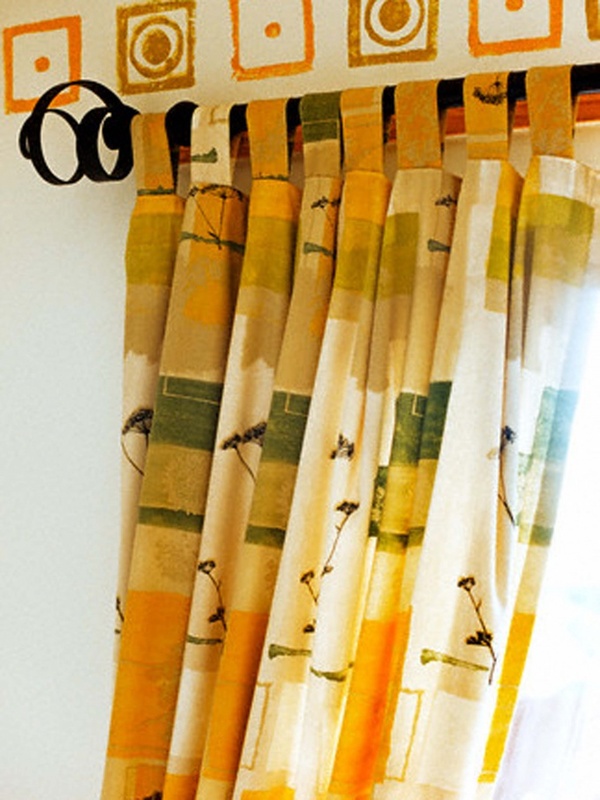 If you have a small piece of the main curtain fabrics, make some loops out of it. Pick up in the same style buttons or obtyanite them the same cloth. If necessary, buy appropriate style of material and learn from it and loops in the edging. For example, use a binding with a relevant in the modern interior geometric pattern. Attach the curtain to the eaves and calculate the required length of the loop. This ribbon of fabric flip over the ledge and attach to the curtain. Add 1.5 cm on allowances for seams. If you do the clasp, you also need to leave an extra 4-5 cm; for ties, create a test site and make pattern to your taste. Pre-made loops for curtains usually have about 3-4 cm wide (not including allowances on the hem). It is believed that the right to lengthen curtains by using the loops need to be seen the top of the window opening. Increase the size of the loops if you want to make the curtain longer. To hide from the overview window, try to hang on top of the pelmet. Such a graceful drape, it is possible to master your own hands. Buy dense but lightweight fabric for pelmets and lining material. Measure the length of the curtains and the height of the window. Make a template of the drape in natural size. Attach it to the eaves, measured off the center of the window. Make pattern of the valance and lining. Seam leave a 1.5 cm Sew a valance with lining by putting the details of the seamy side up. Leave the uncovered part. Press open the seams and remove the finished drapery is evident. Sew cut to the desired length at the bottom of the curtains. When extending the curtains this way, your task – to do the job neatly and with taste, to ensure that the product does not look patchwork. Carefully pick up the texture and colour combination of material. To give the window design perfection, make piping from the same fabric. If you have the overall design style of the room, bottom of curtains can be made in the form of Flirty ruffles. Get creative – for example, decorate the curtain with applique in the same style with Wallpaper and place the wide edge at the bottom and curtains of the same color.